NYC: Support Steve of the Hemo2Homo Connection! 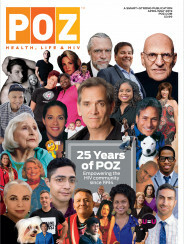 One of my proudest accomplishments as an HIV edu-tainer has been my work with Steve Schalchlin as the Hemo2Homo Connection, the AIDS community’s answer to Ebert & Mr. Roeper. We’ve been laying low recently, after an excellent 2009 that saw us review such stellar films as Wolverine, Star Trek and Watchmen. By “review”, I mean watch the movies and turn everything we see into an excuse to talk about our HIV positive status. Or make fun of one another. My dream is to have some intelligent publisher turn all of our reviews into a coffee table book. But I regress- this update is about what Steve has been up to and how you can support him in his current artistic endeavor. Steve’s been so kind to pass along this discounted offer to readers of my blog. You are so welcome! I love Steve, he’s been such an influence in my life- if you like theater take him up on this offer, and say hi to him for me.